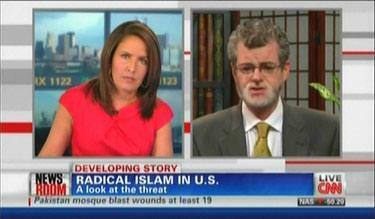 Mark Potok of the left-wing Southern Poverty Law Center claimed on Monday's Newsroom on CNN that radical Islam wasn't "our biggest domestic terror threat," that instead, "that pretty clearly comes from the radical right in this country." Anchor Suzanne Malveaux touted Potok as "expert on extremism" from "one of the most highly regarded non-governmental operations that are monitoring hate groups." Malveaux brought on the SPLC spokesman at the bottom of the 12 noon Eastern hour to discuss the upcoming hearings by the House Homeland Security Committee on the radicalization of American Muslims. The anchor first asked him, "From your study of tracking radical groups, potentially hate groups, what do you think of this hearing? Is al Qaeda radicalizing Muslims? Is that our biggest homegrown terrorism threat right now?" POTOK: Well, I think it's not our biggest domestic terror threat. I think that pretty clearly comes from the radical right in this country, although I would certainly not minimize the threat of jihadist terrorism in this country. Obviously, we have seen a fair amount of it. But what is completely false is, first of all, the idea that Peter King has repeatedly said, that most Muslims are good Americans and so on. You know, in fact what he has said is that 85 percent or 90 percent of the imams running mosques in this country are radical. They're jihadists, and everything suggests that what he says is false. He has also suggested that Muslims are not cooperating with law enforcement, and, you know, we work very closely at the Southern Poverty Law Center with law enforcement officials, and that is absolutely not what they're saying. They're saying they're getting a great deal of cooperation, and in fact, something close to half of the jihadist terror attempts that is have occurred in this country since 9/11 were found out, in fact, because of Muslim informants. MALVEAUX: You said in the beginning that it was not the idea of radicalizing Muslims, that that really was not any kind of significant threat when it comes to homegrown terrorism that- are there other groups to be concerned about that take center stage? POTOK: Set off out just of the blue sky. So, you know, and we're hearing from all over the country from law enforcement officials who are very worried about the sovereign citizens' phenomenon. It's extremely dangerous. So, CNN's "expert" thinks a movement associated with his one cited incident  is somehow a more substantial threat than the Islamism, which has inspired multiple plots and terrorist attacks in this country in recent years. This kind of liberal hype from Potok isn't new. In April 2010, during an interview on NPR , he played up his theory that there was an "astounding growth" in the militia movement since President Obama's term began and tried to connect this to "mainstream politicians and certain commentators...on cable news television shows."